Napili Shores Resort offers luxurious condominiums in the tropical paradise of Napili Bay. The resort is located on six beautifully landscaped acres and has two pools and two restaurants on the property. It's a getaway spot you won't soon forget! Our studio is a comfy, clean, well stocked unit on the lower level at Napili Shores Resort, located on one of the most beautiful bays and white sand beaches on the island. There are two restaurants at Napili Shores, the famous Gazebo restaurant - known for its macadamia nut pancakes and free coffee in the morning - and the Iron Imu restaurant and catering business - known for its on the go barbecue fare. 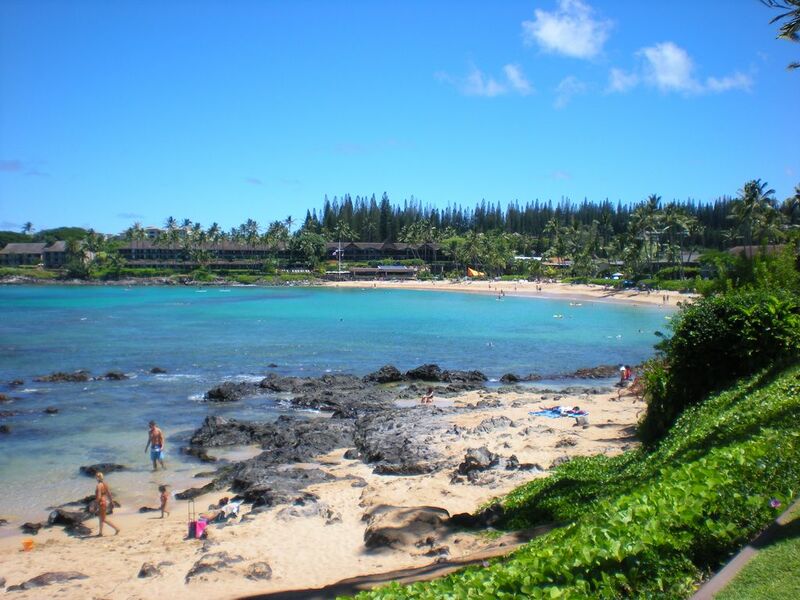 The Kapalua Coastal Trail starts nearby and is a great way to get some exercise and enjoy beautiful views. The Kapalua and Kaanapali golf courses are also nearby for those golf enthusiasts who appreciate a challenge and enjoy beautiful settings. Napili Shores and Napili Bay are home to many wonderful things - the best being a place to relax and enjoy all that a tropical paradise has to offer. Our two units C117 (VRBO #8827) and C121 (VRBO #54919) are located in the C building of the complex - about halfway back in a U-shaped configuration. We have an ocean "peek" from our lanai. The Outrigger at Napili Shores is located at the south end of Napili Bay. The complex sits right at the water's edge with beautiful views of Molokai and beautiful sunsets. You can enjoy a peek of the ocean and the neighboring island of Molokai from our lanai. On the property near the front desk. Parking is free and can usually be found right at the front door. Free WiFi access in the room. We have two coffee makers - one 8-cup and one Keurig machine. Our kitchen is fully stocked with tools and supplies to cook and enjoy full meals. There are two dining tables, one inside and one outside, that seat 4 people each. There are many books that guests share. We have games for all ages - cards, checkers, backgammon, cribbage, etc. We have some pool games for younger swimmers. We have a collection of DVDs for all ages. Our unit is located at the middle of the complex near the lawn and gardens. There is now a rental company on the property that rents out bikes and a variety of water gear including stand up paddle boards. We have an assortment of snorkeling equipment. There is also a rental company on the property that rents out many types of water gear - surfboards, stand up paddle boards, snorkeling gear and more. The Kapalua tennis courts are within walking distance. The Kapalua courses are just a half mile away. The Kaanapali courses are about 10 minutes away. There are two pools on the property. Unit was clean and well equipped. Staff was very nice and helpful. Would recommend to anyone with mobility issues. Easy access to parking, pool and ocean. You will not want to leave but if you must I'm sure you will return. I know we will. We were so happy to have found a quiet complex with a beautiful view for our girl vacation. We ate on our patio every night and enjoyed the ocean in the distance. The location could not have been better as we had a beautiful sandy beach to the right and the perfect snorkeling spot to the left. I wish it could sleep four instead of three so that I could come back and stay here with my family but I wouldn’t hesitate to come back!! The location of the resort was perfect. The actual room was dated and not the cleanest. There were a few things not working and the house cleaner/handyman was difficult to get a hold of and he did not return to fix things. Dishes were dirty and we needed to wash everything we used prior to using them. The studio was well stocked with everything you would need, including spices, shampoo, paper products and many more items. Theresa was great at communicating. Great location, quiet community, exactly what I was looking for. I needed a relatively inexpensive place nearby for my parents to stay while they were on Maui for a visit. This fulfilled all our needs and we were all very happy with it. Exceeded my expectations and beats staying in the big fancy resorts! Napili Shores Resort reminds me of "Goldilocks and the Three Bears". It's not too big, and not too small- it's just right! It has that "Old Hawaii" feel with it's beautiful gardens, the well-kept pools, and the breathtaking views of Napili Bay. During our stay in Maui we split our vacation with a big fancy resort in Kaanapali and here at Napili Shores. Oh-how I wish we had stayed here the entire time! C117 was a dream to stay in. First of all, it was clean, well maintained, and had all the extra fixings! This condo is well stocked with beach chairs, boogie boards, beach towels, snorkel sets, and more. It also had a kitchen stocked with all the gadgetry you'd need- along with spices and other condiments that make preparing dinner on those gas BBQs a dream come true. Our days staying in C117 included going for walks/runs along the oceanfront trail just up the street, lounging at the pools, snorkeling and boogie boarding at Napili Bay, eating at the Gazebo, cooking/BBQing, playing shuffleboard, searching for geckos, and heading down to Lahina, Kapulua Bay, Kaanapali, and beyond. You could also go and swim with the turtles...literally right below and to the right of the Gazebo restaurant that's on the property. Amazing! What I really liked about Napili Shores vs. the big resorts was it's "coziness". We could park our car right by our condo and not have to valet-park it or our car be far away in some packed parking lot. We didn't have to swim in a pool with 50 other people or frantically try to search and stake out a chair near the pool. And, we could easily go for a dip in the pool, go to the condo, and then right over to the ocean without having to travel across an expansive resort property. Yes- maybe Napili Shores doesn't have the waterslides or the cocktail drinks by the pool- but it also didn't charge me extra to rent an umbrella for pool shade and swimming with those giant sea turtles was priceless! The owners were a pleasure to work with and I highly recommend C117 for your next Hawaaian get-away. You will not be disappointed! We came in May of 2010 with our whole family! 13 of us. Children, spouses and grandchildren. We had the best vacation ever. The room was equiped with all we needed to enjoy the beach and pool. The family atmosphere and the barbeques made us feel like we were really there to relax and enjoy our family! We have been to Napili Shores 6 times and this was the first time going through VRBO. I would do it again in a heartbeat. I missed the little wonderful soaps and lotions, but the cost differncial was worth it. You can buy the lotions and soaps at ABC if you really consider that a deal breaker. I dould definitely recommend this property to friends and family. There are two restaurants at Napili Shores, the famous Gazebo Restaurant - known for its macadamia nut pancakes - and the Iron Imu restaurant and catering business - known for its tasty barbecue fare. There is a $75 check in fee that the front desk collects. Our $100 cleaning fee is waived for stays of 7 nights or more. We offer a free night for stays of 11 nights or more.